DERRY has elected a new mayor for the year ahead - DUP councillor Hilary McClintock. Cllr McClintock, who took up the busy post last night, pledged her commitment to represent the entire council district by "working tirelessly to make a difference to create a vibrant and harmonious community". Cllr Jim McKeever, SDLP, was elected her deputy mayor at the meeting. The theme of Cllr McClintock’s mayoral year is “Making a Difference” where she intends to work in close partnership with elected members, council officers and key stakeholders for the betterment of the Derry and Strabane District. 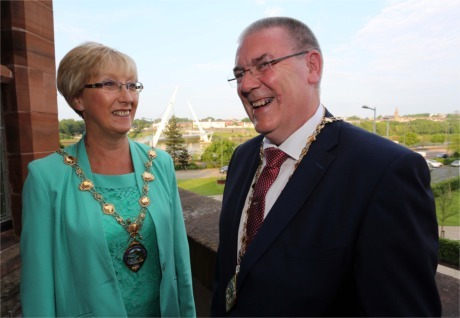 The new Mayor of Derry City and Strabane District Council, Alderman Hilary McClintock pictured with Deputy Mayor, Cllr Jim McKeever following their official appointment at the Guildhall on Monday evening against the beautiful backdrop of the Peace Bridge in the sunshine. In her inaugural speech, she praised the hard work and commitment to the role of outgoing Sinn Féin mayor, Cllr Elisha McCallion. She also outlined how her experience working in the playgroup sector in Strathfoyle and Gobnascale, as well as children with special needs at Belmont House School, as having a huge impact in shaping her path. “I want to meet with many people and many groups during this next year. I want to talk to people and I want to listen to people. As a council we have made great strides in improving communication, through webcasting, website, social media as well as the more traditional forms of email, letter and newspaper," she said. "We have involved many more people in decision making processes which affect them and I look forward to the opportunities that will arise to share with you all during the next year,” she added.